How You Can Deal with Your Spouse's Loud Snoring Sound? You are a very busy person, and at the end of the day you need a full night of sleep to keep yourself healthy. However, lately, it has been hard to do so, because your spouse has been keeping you up at night with loud snoring sounds. Thus, you need some advice as to how to deal with these annoying snoring sounds. No doubt you have probably at least once seen a comedy in which a character would make a loud snoring sound to deliberately annoy someone. This is not the case with your spouse, and most likely your spouse is completely unaware that her or she is doing it. In fact, if you were to tell your spouse (as you might have already) about how the loud snoring sounds are keeping you awake at night, he or she might respond with surprise! So, what can you do to overcome these snoring sounds? The first thing you should do is go to your local convenience store and see what is available in terms of snoring aids. Think of your spouse and what he or she would agree to wearing (like breathing strips) and purchase the most reasonably priced one. Give this option a few days to work, and if nothing changes, it is time for you to move to the next step. You need to sit down with your spouse and tell him or her that they really need to get their snoring in check by visiting their doctor. Your spouse should care about your health, so he or she will go to get things checked. If your spouse is especially stubborn and refuses to do anything, you are going to have to go into another room. Politeness dictates that the woman always gets the bed, so make your plans accordingly. If you are the husband in this situation, then be sure that you have a comfortable couch available! Some couples actually have had to get separate bedrooms because of snoring problems. So certainly do not want to become one of these couples, so patiently convince your spouse that he or she needs medical attention if the snoring persists. 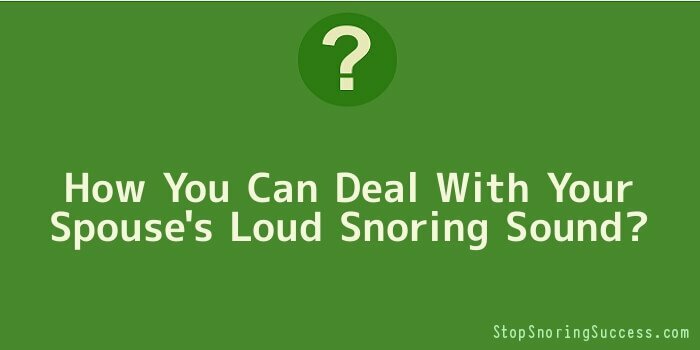 For more information on how to deal with a snoring spouse, ask your own doctor for advice. You can also consult the internet, but make sure that you only seek advice from the official websites of various medical groups. With patience, you will not only get the sleep you need, but you will also have a snore-free spouse!